I recently started collecting Vostok Europe watches. These very unusual watches celebrate Soviet technology, which is, to say the least not your ordinary watch theme. This is a picture of my prize Vostok Europe watch, the Arktika, a watch that is named for the Soviet ship Arktika, a reactor powered ice breaker, that sailed to the North Pole. 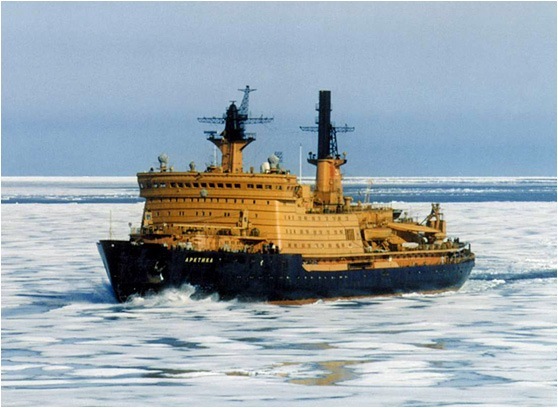 The Arktika was the first ship to sail to the North Pole on the surface, and this is considered quite rightly to be a major accomplishment of Soviet technology. Vostok is Russian Watch manufacturer that had its origins in the evacuation of Soviet industries from Western Russia during the early days of the German invasion of Russia in 1941. During the cold war era the Vostok factory made watches for the Russian military. While many Soviet consumer goods were shoddy, this was not true of Russian military watches. After all, watches are useful military instruments, and keeping good time is something that any Army or Navy would value. In a war the Vostok watches can be regarded as very good time pieces for people who may need actuated time pieces on important jobs. Vostok watches are relatively impervious to environmental insults. Most can be used as divers watches. The Vostok Europe Arktika will remain water tight at 150 feet of water for example. Water tightness is, of course, a desirable military quality, and is useful for all sorts of situations including conducting military operations in the mud, or simulating an invasion of Camp Lejune. The Soviets did not develop the sort of low cost, accurate quartz watch mechanism they became common in the West during the 1970's. Thus Russian watches tended to be very good quality mechanical watches. And while the Russians did not develop outstanding quartz mechanisms, Vostok developed a very good automatic watch mechanism. An automatic mechanism is a descendant of the self winding watch concept. Rather than winding a spring, the automatic mechanism runs a tiny generator, and electricity is transferred to a capacitor, which stores it. The electricity then operates a quartz mechanism. All this sounds very complex, and it is. To accomplishes with a great deal complexity what a battery does for an ordinary quartz watch. Of course the battery has to be replaced every couple of years, And that means finding a jewelry store that does watch repairs. The automatic watch mechanism does not last forever, but it will keep going a lot longer than the battery powered quartz watch. Of course you have to wear the automatic mechanism watch and be at least a little active. Wearing a Vostok watch in bed and tossing and turning seems enough to keep the juice flowing. No doubt Vostok watches with automatic mechanisms were highly prized by Soviet military officers, a class of customers who expected much higher than average Soviet quality from their watches. You did not get to be the official watch manufacturer for the Red Army by selling Red Army Officers shoddy watches. So Vostok had a high quality automatic watch mechanism, a watch mechanism that delivered the goods to a group of tough customers, and stood up to the stress of military use. The Vostok automatic mechanism is extremely unobtrusive. It is quiet to the point of silence, and imparts no feelings to the wrist as it operates. Unlike the classic Swiss 21 jewel movement, the Vostok mechanism featured 32 jewels. I did not wind the first Vostok watch I ever wore, or even do more that shake it a few times before setting the time and putting it on. It ran unerringly and I wore it when I went to bed. When I woke up it was still running and the time was accurate. Vostok still manufactures watches that are sold in the Russian equivalent of the PX, and their watches are now prized by collectors in the west. The Vostok 32 jewel automatic movement is a real prize in terms of quality and it is not surprising that Vostok decided to develop a line of Luxury watches for the European market. The Vostok Europe Company is based in Lithuania, and thus has access to the EU market. In addition to the Vostok automatic mechanism which is probably the quality equivalent of the Swiss automatic movements that go into thousand dollar watches, the Vostok Europe company has managed to produce watches with attractive designs. There are hints that the cases are manufactured in China, and if so this would not compromise Vostok quality. Vostok Europe watches are men's watches. They are big, and suggest a self confident assertiveness that is consistent with their Soviet military origins. They say, if you mess with me, I will invade Poland. At the same time they are handsome. The case and band are stainless steel, but this Arktika is plated with a copper alloyed gold, that adds a stunning luster to its appearance. The watch is beautiful, and is a fitting tribute to the nuclear powered Arktika's voyage to the North Pole. The Seiko Kinetic watches also operate like this. They will run up to a week on the stored energy in the capacitor. After the week, the stepper motor running the hands is shut down, but the electronic timer keeps running. When the watch is worn again, and the capacitor is recharged, the hands are rapidly placed into position to indicate the correct time. Numerous watches use automatic mechanisms. Most use low cost mechanisms built in Japan and China. I have a Shturmanskie wrist chronograph of the sort cosmonauts wore in the 70s, but most of my Soviet watches are not merely quartz, but digital. They have a various track record; some of them don't work, and others are about the best digital watches I have from their vintage. Some of them have really eccentric design features; most of them will display the time in 24-hour mode only. My favorite is an example of the Elektronika-5 LCD pocket watch from the 1980s.